Memories of farmers market lunch, fiestas, birthdays, festivals, funerals and church picnics come pouring back to me with each bite—tangy, pica, salty with flaked coconut and green onion. I recall eating chicken kelaguén and tortillas in the school parking lot with a jar of King’s brand kimchee waiting in the glove compartment—AC full blast with Journey blaring out of a cheap car speakers... ah island life. Kelaguen is Guam’s (unofficial) national dish. It’s more akin to ceviche but made with fresh calamansi lime juice, fresh coconut flakes and crushed done sali peppers. It can be made with chicken, fish, shrimp, deer meat, but if you’re a stone-cold Chamorro you’d use diced Spam. As a vegetarian friend suggested, it’s just as tasty made with pan-seared seitan. Living in Brooklyn I found it difficult to get some of these ingredients but I’ve learned to substitute. I hear I can get them in Queens, but I’m not going to Queens just for three ingredients. Pronounced doh-ni saah-li, this pepper is the building block of Marianas Island cuisine. Its unique flavor has a sulphury bite with a sweet citrus finish and a Scoville level equal to shishito pepper. When ripened, clusters of red fruit point upwards above the plant like tiny fingers. You can’t find it fresh in NY, but I matched a flavor profile using fresh Korean peppers, garlic and lemon zest. Kamyu is a very old-school technology. I’ve found frozen packages of coconut (unsweetened, whole meat or grated) in Asian stores. At a price, you can find coconut— whole in shells, at finer grocers. You can use a food processor or micro plane if you don’t have the old-school lap grater. I prefer to rehydrate dried coconut flakes instead; sometimes frozen coconut meat can taste freezer burned. I’ve also seen frozen calamansi lime juice in Filipino Foods stores. These frozen or dried ingredients are easier to prepare and make less waste, but of course they are not as good as when you use them fresh. Funny side note, my mom smuggled the “death star” (pictured left) into my luggage on a trip back from Guam. In Chamorro it’s called the “kamyu” (kahm-dzu). 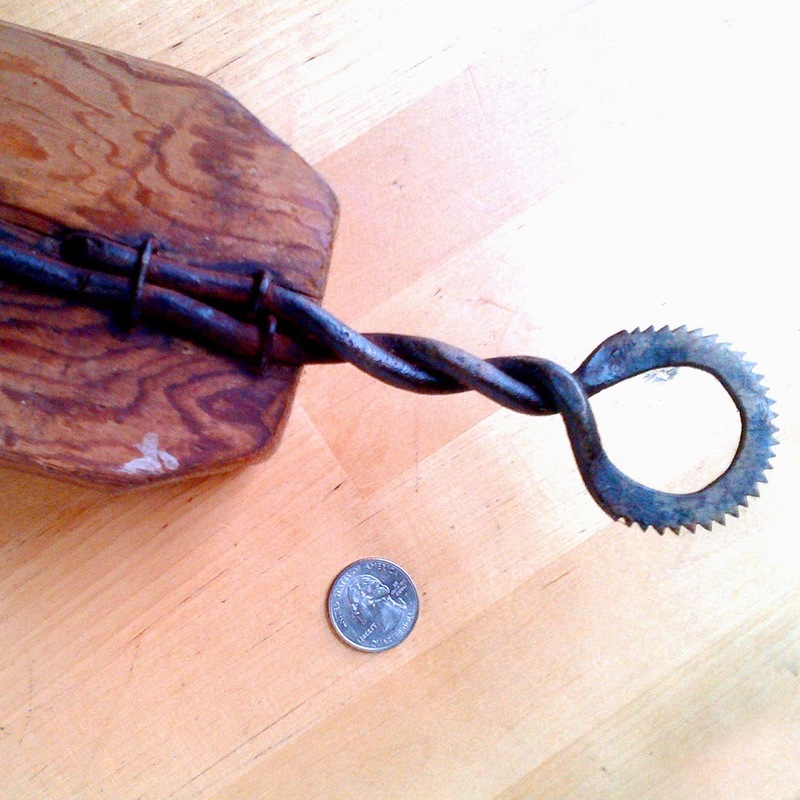 My Uncle Adonis made it for our family from pounded rebar and a wooden plank. I had no idea that it was in my luggage until I got to Honolulu International Airport. My bag went through and I saw that familiar serrated head peak through the X-ray scanner. I went white with panic that I’d be detained in interrogation and miss my flight back to NY. But instead the airport security guard just said ”Wow that’s an old coconut grater” and let me through. Here’s a simple recipe that uses ingredients you can get from your local grocer. It’s gluten-free by nature and tasty. To rehydrate add 3 tbsp of boiling hot water to one cup of dried unsweetened coconut flake. Mix and allow to rest in a close container for 30 minutes, then refrigerate for six hours or overnight. Poached chicken meat: bring two cups of water to boil, add chicken meat. Cover and simmer for five minutes, removed from heat and poach for 10 minutes. Drain and allow meat to cool, then roughly dice and shred into finer pieces using two forks. Refrigerate until ready to use. We had two calamansi lime trees in our yard, the flowers smell like jasmine and grapefruit and when the fruit is fully ripened it tastes like a cross between a tangerine and a lime. It was great having these wonder fruit trees but I hated shaking the rat snakes out with a rake before I’d go picking. In a large bowl mix lemon juice, shallots, fresh Korean chili, minced garlic, salt and lemon zest. Mash these together with a fork, add chicken meat and coconut flake. Mix well, transfer to a closed container and allow to macerate for an hour in the refrigerator. Salt to taste before serving. Serve on freshly toasted tortillas (gluten-free or regular) topped with chopped fresh mint and more coconut. It’s even better on waffles or blinis served with a generous side of kimchee! Kelaguen will keep refrigerated for five days... if there’s anything left to put away. "Kreasi LAGU WAJIB NASIONAL INDONESIA Masa Kini : Persatuan INDONESIA"
Three Cheers for the Gluten-free EatUP!